Opening on Friday, October 12th, 2018 at 12:00 noon SLT is a new installation by Alo (Aloisio Congrejo). Black and Colours is being hosted in The Womb, the recently revamped exhibition space at DiXmiX Gallery. And I have to say, that it is a curious piece. Lacking liner notes from the artist, the installation is a multi-faceted piece entirely open to interpretation. Within the darkened hall is a mix of 2D the 3D elements, some of which are presented more-or-less as “traditional” photos; others appear to be 3D images offered 2D images; some are strongly abstract in nature while others mimic a polarisation approach similar to that found used by 3D movies to present what appears to be 2D art in 3D. All of which adds up to a richly diverse installation. As might be expected from reading the title of the installation, there is a deliberate play through between black and the use of colours – most notably red and yellow, together with that other neutral – white. This is itself highly effective in drawing the eye into the installation, while the linear aspect in much of the art adds a geometric dimension to the entire installation that allows the wall mounted elements (together with the figures that might be close to them) to both exist independently to one another, and yet also be bound together by the white-on-black pattern of lines on the floor. This subtle linking may well not be initially apparent, the eye perhaps initially being drawn to a colourful, strongly abstract free-standing scene within the hall. At first looking like paper shapes patterned in swirls and lines of black-and-white or red-and-black, skewered by red, yellow and black pins forced into the floor, these shapes are transformed by camming around them into what might be dancing couples caught in a complex set of tangos performed to unheard music. This abstract element is bookended on either side along the length of the hall by Alo’s photo images, which I confess to finding the most eye-catching. Furthest from the floor sculpture is a series of enticing white-on-black images of a near-naked woman. Marvellously lit, this series of images looks almost 3D in its execution, each of the images emphasising a different element of her pose: full body, booted legs, gloves arms with turned-away head between… In their midst is a further version of the image set behind 3D elements, all of which combine to suggest – from a distance, 2D art projected as a 3D piece. The other display is a subtle and complex set of images of a woman’s head which I strongly recommend camming across slowly to fully appreciate them. Each is a layered construct, designed to mimic a polarised 3D effect, something which comes into focus (quite literally) as the camera faces them and glides from one side to the other. Not only does this highlight the “polarising” element, it also brings forth the subtle shift in colour tones used within the images. I confess I have absolutely no idea how to interpret or quantify Black And Colours – or even determine if it needs interpreting in any way; I also admit there are elements to the piece that escape my ability to quantify. But this does not diminish Black and Colours in any way; it simply means this is a piece very open to personal interpretation throughout, and thus an installation that should be witnessed first-hand. Testing still in progress on Aditi, with test parcels for users still available. 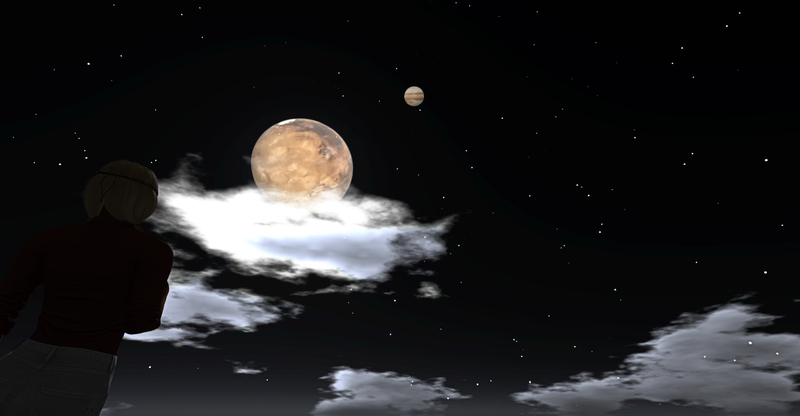 Test region: Aditi EEP Testing (secondlife://Aditi/secondlife/EEPTesting/128/128/23). Parcels cost L$1, but as Aditi funds are provided by Linden Lab, you are not paying for anything with your own money. You MUST be using the EEP test viewer why trying to purchase a parcel on the test region – if you are using any other viewer, your purchase will time out. Feedback via Jira (bugs and requests) and / or through comments on the forum feedback thread. An update to the project viewer is expected soon. Graham Linden is continuing to work on the shader support. The update to the Bake Service to support 1024×1024 textures has run into problems. Anchor Linden is working on fixes for the issues, and once these have been implemented then the viewer should receive and update as well. The RC viewer updated on October 8th to version 6.0.0.520211. It had been hoped with would be the last RC version, but issues mean this will not be the case. Performance issue: BUG-225584 and forum thread. This is related to the new dynamic bound box used with Animesh. Vir is working on the issue, and Beq Janus from the Firestorm team has been involved in investigations as to the degree of potential impact. There have been one or two sensationalist blog headlines – best to read the forum thread and the bug report. Part of the thread has spun away into handling attachments on Animesh. While this is not a part of the initial Animesh release, hopefully the discussions can be split off into their own thread. Imposters issue: Animesh objects can imposter independently to avatars. This can result in an avatar rendering normally when seen by others, but any attached Animesh being impostered (or possibly vice-versa). This is being fixed so that an Animesh attachment will now have the same imposter setting as its parent avatar. The update will be in the next RC update. There is a Mac-specific graphics issue that can result in Animesh objects vanishing from the scene when crossing a region. This is also being worked on. There has been some preliminary discussions in the Lab on how to make Animish distinguishable / locatable on the Marketplace (e.g. categories, etc.). No decisions as yet, but the Lab is interested in feedback at CCUG meetings or through the Animesh feedback thread. Problem here is the risk of confusion cross-over. Do trees animated via Animesh require their own sub-category under “Animesh”, should they have an “Animesh” style sub-category under trees and shrubs (itself already a sub-category of Home and Garden >: Landscaping)? There’s also the question of what to call an over-arching category: “Animesh” is a truncation of “Animated Mesh”, and has been used within the project, etc., but those unfamiliar with the project might be confused by it; so might “Animated Mesh” be preferable? A problem here is “Animated Mesh” itself is a little ambiguous in meaning. Triangle counts have been suggested as an alternative, but this requires some form of automated count system for items uploaded to the MP, which in turn would require significant changes to the MP tools. Even if a tri count could be auto-generated, would people take more notice of it or a given LI? A portion of the meeting was taken up with Blender / Maya specific conversations on bone placement for making taller avatars or for use in things like snakes and ropes. There was some discussion on altering the axis rotation in the mesh uploader to match the likes of Maya and Substance Painter. As Vir noted in the meeting, there are an array of potential improvements that could be considered for the uploader – but as yet, a specific project hasn’t been defined to it – and any such project would likely be open for creator input. Support for additional material maps: there has been various discussions (in the forums, etc), but SL supporting additional material maps – roughness, metalness, displacement, etc. Nothing official is on the table from the Lab, but earlier in 2018, Kitty Barnett did some experimenting with displacement maps with the Catznip viewer – although this should not be taken to mean this is something that will be supported by Catznip or other viewers. Vir hopes that Graham Linden will be able to give some thoughts on expanding material maps support in the future CCUG meeting. Displacement maps, experimented with by Kitty Barnett earlier in 2018, might – if they could be implemented – add further depth to surfaces. 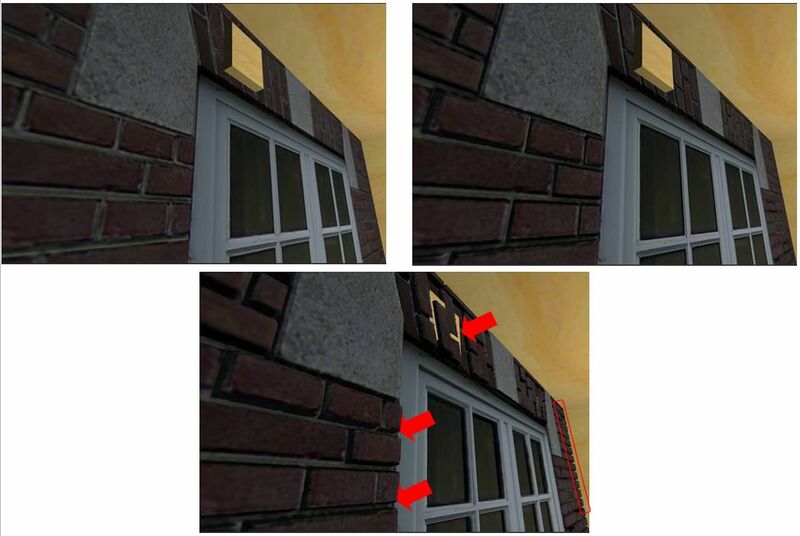 For example: top left – a prim wall with a brick texture; top right: a prim wall with a texture and normal map applied, as we’re used to seeing in Second Life – some depth is added to the cement grouting between the bricks etc. Bottom centre: the same prim wall with the same texture added, but now using a displacement map: note the greater apparent depth between bricks and cement grouting, etc (highlighted).